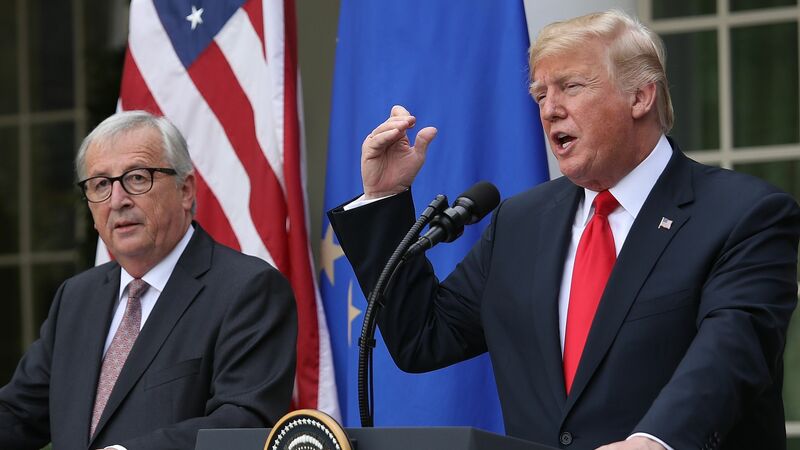 President Trump emerged from a trade-focused meeting with European Commission President Jean-Claude Juncker and said Europe will become a "massive" buyer of U.S. liquefied natural gas. Reality check: Thus far, Asian countries and Mexico have been the main buyers of U.S. LNG as the industry has emerged in recent years, but there's room for growth in Europe as exports rise and new projects come online. But while boosting gas exports to Europe is a goal that dates back years, some analysts say there's reason to doubt that the continent will ever become a huge destination for U.S. cargoes, given its closer and less expensive options. What they're saying: "U.S. LNG is competitive in Europe on the spot market when the price is low, as it is now. In the future it will be hard to compete with piped gas from Russia and closer sources of LNG," David Goldwyn, a former senior State Department energy official and now head of the consultancy Goldwyn Global Strategies, tells Axios. "[A]s soon as the Russians get greedy, U.S. LNG provides a ready substitute. U.S. LNG has made the global gas market competitive. But it is unlikely we will export vast quantities of LNG to Europe unless the Russians overreach. If they do we will quickly take their market share."